Peacocks are peculiar creatures. Regal in stature, these majestic looking birds roam La Residence at their leisure. 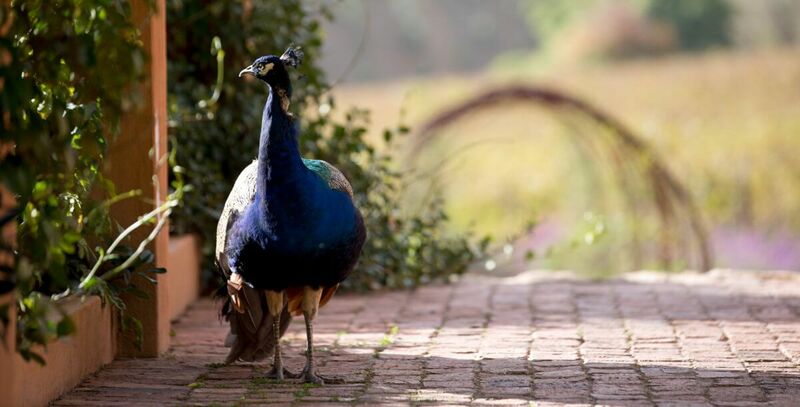 Anyone who has visited La Residence in Franschhoek will know that there are several idiosyncrasies which make the extraordinary estate so special. The remarkable staff, acclaimed for their superior, personalised service, welcomes guests into their home in the Cape Winelands. From doorman to departure, guests are made to feel like royalty. La Residence’s location is another feature which makes the hotel so special. Flanked by vineyards, fascinating fauna, and the gardens of a working farm, one can’t help but marvel at the surrounding beauty. In South Africa, it’s not often that one sees a peacock. 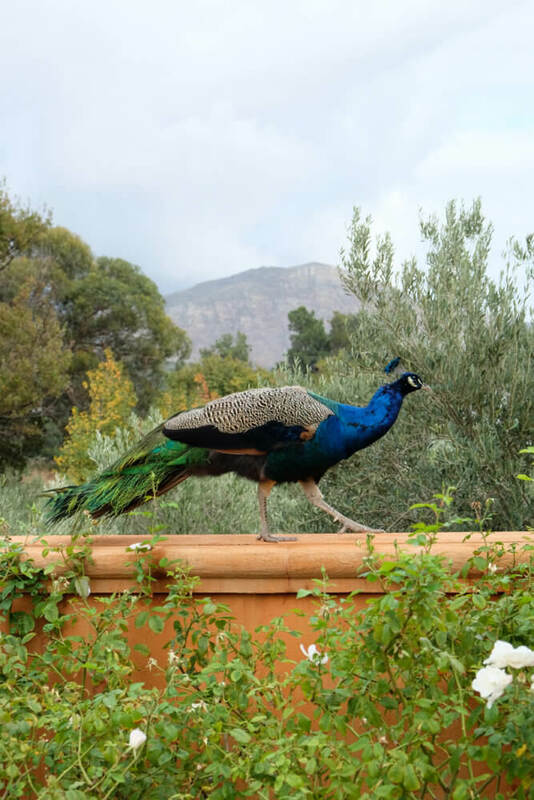 Only a lucky few have witnessed one waltz across The Great Hall, La Residence’s stately dining area, saunter out towards the central courtyard, and showcase a majestic plumage against the picturesque backdrop of the distant mountains. Given their palatial surroundings, it’s no wonder these regal birds have adopted a penchant for posing for photographs. Most people use the term peacock to describe both male and female birds, but peacock is actually the name that refers to male peafowl. Peafowl is the correct name for all genders of this pheasant family. The female peafowl is called a peahen. Peahens are smaller and grey or brown in colour. There are three types of peafowl, the Indian Peafowl, the Congo Peafowl, and the Green Peafowl. The Indian Peafowl [Pavo cristatus] is at La Residence. They are one of the largest flying birds. Their length (including tail) can reach 6 feet. They can weigh between 3.5 – 6 kilograms. A peafowl can live for over 20 years, although the peacocks plumage looks its best when the male reaches the age of 5 or 6. A family of peafowl is called a ‘bevy’. 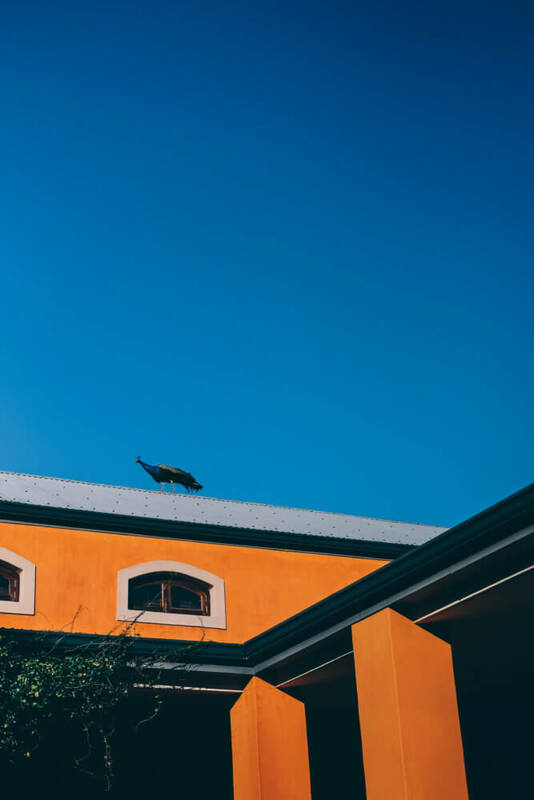 La Residence is a working farm, and so apart from the vineyard and garden produce which are integral to the culinary experience for our guests, the estate also plays host to a number of rare and interesting animals. Tango and Twist, the miniature horses, are just two of the characters that you might bump into at La Residence. Keep an eye out too for the springboks, guinea fowl and sable antelope. 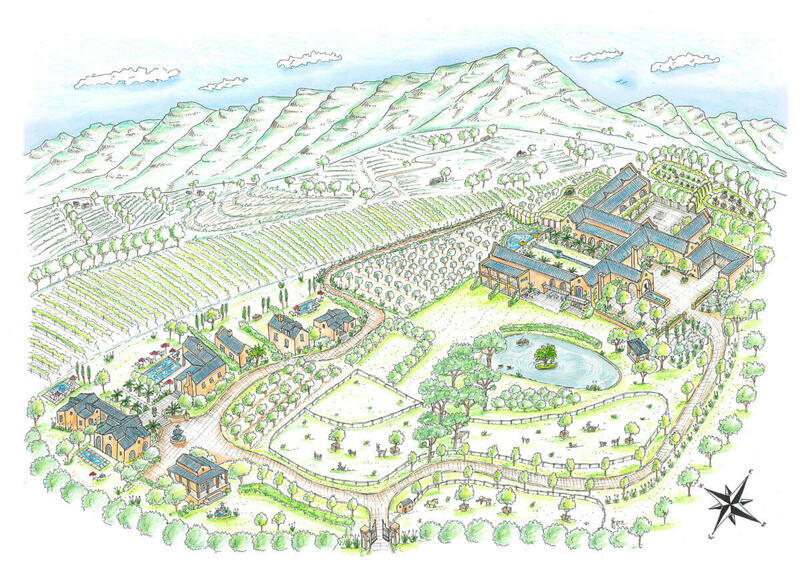 You can spot the springbok and sable as well as the miniature horse paddock in this lovely illustration of the La Residence estate. Franschhoek is known as South Africa’s culinary capital. The ethos at La Residence is very much ‘farm to table’. Executive Chef Lennard Marais oversees the dining experience.. His cuisine emphasises fresh, local ingredients, many of which are grown on the estate. 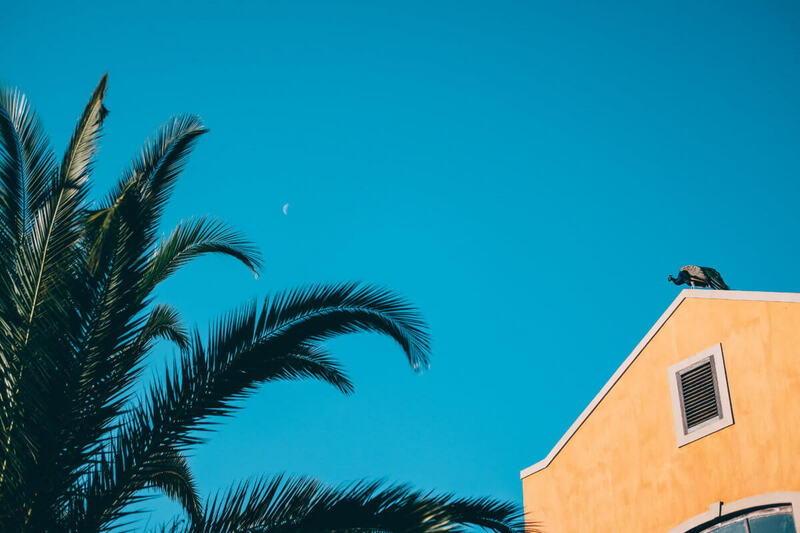 You can book your stay at La Residence Online. A particularly brave peacock scaling the entrance wall. 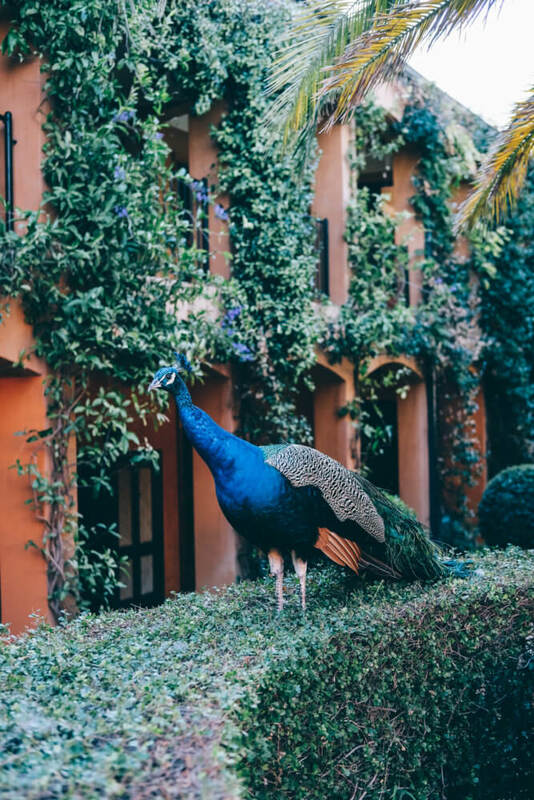 The peculiar creatures love resting on the hedges surrounding the central courtyard of La Residence. Images thanks to Sergio Ines (@whatmyboyfriendwore) and Amy Seder (@amyseder).